Around the same time, an email from History Matters/Back to the Future dropped into my inbox with an invitation to participate in their One Play at a Time initiative. Registering meant agreeing to teach one play written by a woman playwright from history to my class, and, if I signed up, my students would be eligible to submit to the Judith Barlow Prize. If one of them won, they would get $2500—and I’d win $500. This got my attention, and I began signing up every semester. I started by teaching Susan Glaspell’s brilliant 1916 one-act play Trifles, which was surprisingly effective in presenting the elements of dramatic writing I covered in class. My students’ work got better, but over time I noticed another shift. Every semester, I’d ask them how many women playwrights they could name. The first time I asked the question, most of my students knew of only a few, like Lillian Hellman and Lorraine Hansberry, and their limited knowledge didn’t seem to bother them. But, as the years have passed, I have noticed that even if my students can’t name many, they are aware that there are plenty of women playwrights, and they should know more of them. Last fall, when I asked the question to my students (full disclosure: these were the theatre majors), they filled up two dry-erase boards with the names of women playwrights they knew of or had heard of. We’re less than two years away from 2020, and though we aren’t likely to reach full gender parity by then, maybe something in the zeitgeist is moving us in the right direction? The mission of History Matters/Back to the Future is “to promote the study and production of women’s plays of the past in colleges and universities and theatres throughout the country and encourage responses to those plays from contemporaryplaywrights.” (Italics are mine.) 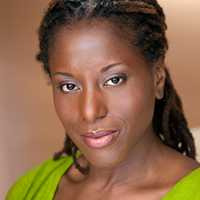 The brainchild of Joan Vail Thorne, History Matters came out of a response to the 2009 Emily Sands Study at Princeton University, which examined gender bias in the theatre and confirmed discrimination against female playwrights. Thorne, a veteran regional theatre director, playwright, librettist, and teacher, came of age during the regional theatre movement, which, Thorne reminds me in our interview, was spearheaded by two women: Margo Jones and Zelda Fichandler. “Of course, everyone was enraged and sad,” Thorne told me, speaking of the study, “but we’d heard this before.” In 2002, Suzanne Bennet and Susan Jonas had conducted a study for the NYS Council of the Arts that had revealed the same profound disparity between professional productions written by men versus women on the American stage. Thorne was angry, but she didn’t want to wallow in it. “We were always lamenting,” she said, and her instinctive resistance to lamentation led her to seek out something to celebrate instead. Thorne and her colleagues—academics and theatre artists—found plays, and a lot of them, written by women who’d been forgotten across decades and centuries. Thorne describes these writers as “young radicals, with tremendous passion,” who were writing plays that “even when they were commercial were about something important.” The plan wasn’t to just blow the dust off old plays; Thorne hoped to connect young playwrights with these works, inspiring them to write their own equally powerful plays. One Play at a Time was launched, and the competition’s prize—named after Judith Barlow, the editor of Plays by American Women, which reintroduced playwrights from 1900 to 1930s and again from 1930 to 1960s to the public—comes with a generous purse, signaling to young writers that their work is worthy of compensation. To read Tammy’s essay in its entirety, please visit http://howlround.com/women-s-history-matters. The New Black Fest and The Lark, two theater organizations dedicated to celebrating and advocating for stories that explore the intersection of art and social justice, are proud to announce the fifth annual The New Black Fest at The Lark. This week-long event is aimed at showcasing diverse and provocative work in a festival of Black theater artists from throughout the Diaspora, and will feature talkbacks, a panel event, and staged readings of four plays-in-progress. The festival will take place April 9-13, 2018, and will include works by 2017 Djerassi Writer in Residence France-Luce Benson (Deux Femmes On the Edge De La Revolution), 2018 Laurents/Hatcher Foundation Award recipient Donja R. Love (soft), 2015 Princess Grace Award-Winner Jonathan Payne (Brother Rabbit), and artist, activist, and The New Black Fest alum Liza Jessie Peterson (Sistergurls and the Squirrel) who has performed excerpts of her one-person play The Peculiar Patriot in over 35 penitentiaries across the country. The theme of this year’s festival, Black Love, Black Space, and Solidarity, was conceived by Keith Josef Adkins, Artistic Director and Co-Founder of The New Black Fest, in response to the world’s continued shifting. The festival will kick off with a panel discussion on this theme, moderated by Adkins, and featuring Keith A. Beauchamp (Filmmaker, The Untold Story of Emmet Louis Till), C.A. Johnson (Playwright), Dominique Morisseau (Playwright, TV Writer, Actor, and Social Justice Activist), and Quentin Walcott (anti-violence activist, educator, and facilitator). Adkins’ focus on community cuts to the heart of why The New Black Fest and The Lark have sustained this collaboration through to its fifth anniversary. Read the full article from Broadway World here. 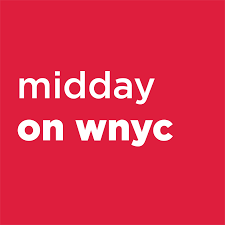 Check out Midday on WNYC‘s podcast: A Play on the Trans Experience, Through Voices of Family with Mashuq Mushtaq Deen, Resident Playwright at New Dramatists, who discusses the New York premiere of Draw the Circle. With a book by the TV writers Dusty Kay (“Roseanne”) and Bill Nuss (“Pacific Blue”), music by Stephen Weiner and lyrics by Peter Mills, “The Honeymooners” tells a new story that would not have felt out of place on the original sitcom. Here on the stage of the Paper Mill Playhouse,Michael McGrath and Leslie Kritzer were rehearsing what appeared to be a conventional scene from “The Honeymooners,” the 1950s sitcom. Against the backdrop of a luxurious apartment far beyond their modest means, Mr. McGrath, playing the rotund blowhard Ralph Kramden, was apologizing to Ms. Kritzer, as his endlessly forgiving wife, Alice, for another harebrained scheme gone awry. “The Honeymooners,” in its best-known incarnation as a CBS series, starred Jackie Gleason and Audrey Meadows (playing the Kramdens) and Art Carney and Joyce Randolph (as their neighbors, Ed and Trixie Norton), a pair of blue-collar couples with big dreams that perpetually elude them. 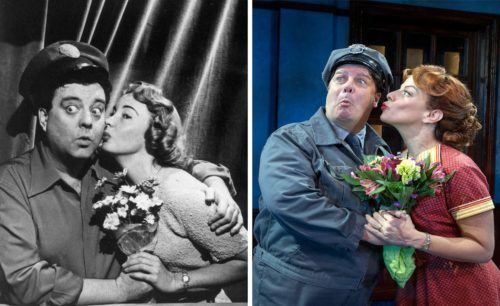 The simple dynamics it depicted – the relationship between a man and his wife, and between that man and his best friend – are fundamentals that the cast and creators of the “Honeymooners” musical hope to duplicate. Back by popular demand (and just in time) WORD BECOMES FLESH is theatre worth doing more than thinking about. This encore presentation written by Marc Bamuthi Joseph with additional dramaturgical compositions by Khalil Anthony and Dahlak Brathwaite and directed by Psalmayene 24 is an arresting composition of dance, hip-hop, music, and spoken word performed by an indefatigable five man ensemble. Louis E. Davis, Chris Lane, Clayton Pelham Jr., Gary L. Perkins III, and Justin Weaks, with nary a weak link among them, move with one heartbeat as they perform a series of letters from a young black man to his unborn son and explore what it means to grow up black in the 21st century. Sneakers squeak, sweat drips, music blares, voices reverberate around every corner of the intimate theatre. It’s clear a rebellion is taking shape. Director Psalmayene 24 does not want us to mistake this work for anything but a rebellion- a peaceful and artistic rebellion. Psalmayene notes the “arsenal of movement, sound, and lights” more powerful than bullets and bombs that the cast and creative team employ. The ensemble dives into the perpetual battle against terrorism African Americans have always faced while giving voice to an all-encompassing anxiety in the face of bringing a child into such an environment. WORD BECOMES FLESH displays the fullest embodiment of bodies-a physicality so intimately married to the power and complexity of language that it at once feels like an affirmation, a confrontation, and an invitation. You will be left reeling. From the moment the lights gradually come up from total blackout, lighting designer William K. D’Eugenio and sound designer Nick the 1da work in tandem to ensure that we simultaneously see and hear the beating heart of this production. With the support of the entire exceptional creative team, the ensemble takes flight, displaying an impressive range of emotional as they flit in and out of the central voice of the young father. If you want to see theatre for social change at it’s most potent, check out the Word Becomes Action Festival at Theater Alliance. Read more from Broadway World here.